"Returner Jacoby Jones #12 of the Baltimore Ravens returns a 105-yard kick-off return for a touchdown against the Oakland Raiders in the fourth quarter at M&T Bank Stadium on November 11, 2012 in Baltimore, Maryland. The Baltimore Ravens won, 55-20." When the Oakland Raiders came into town to take on the Baltimore Ravens I would have never guessed that 75 total points would be scored. I started the game in the nose bleed sections covering the game from a different angle. Despite being continually talked to by fans, it was refreshing to shoot the first half from a place that provided clean backgrounds and a view different from the pack. Although I ended up missing one touchdown while getting trapped in the elevator, I ended up being in the right places most of the game. 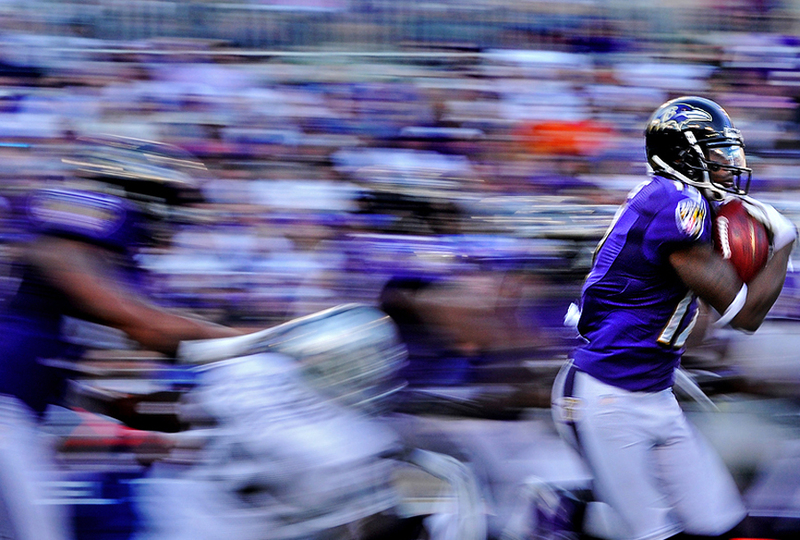 As the game progressed, it was obvious the Ravens were reaching record setting status. So I tried to shoot a bit more relaxed. Just as I thought that, and deciding to pan a kick-off, Jacoby Jones of the Baltimore Ravens pulled another stunning kick-off return. Just weeks before, Jones tied an NFL record with an 108-yard return to score. Sometimes things come together for a reason. This ended up being the big play of the game and the nail in the coffin. As they say, with risk comes reward.